Back in July of last year, Talia Lavin was fired from her job as a fact-checker for the New Yorker after she misidentified a wounded Marine's elbow tattoo as a Nazi "Iron Cross," and convinced much of the left that the Immigrations and Customs Enforcement agency had hired an actual white supremacist to work on their abuse task force. Saturday, she was at it again. The self-described "expert" on white supremacy, in an effort to defend Rep. Ilhan Omar (D-MN), who flippantly referred to the September 11, 2001 terror attacks in a speech as "some people did something," Lavin asked whether we're supposed to believe that 9/11 is "sacred." The Tweet was a reaction to, of all people, Rep. Nancy Pelosi (D-CA), who referred to September 11th as "sacred ground," taking both Omar and President Donald Trump -- who posted video of the attacks as a way of reminding Omar why 9/11 commands so much respect -- to task. Lavin, who now works as a reporter for Media Matters tracking "white nationalism," and will teach a course on journalism this summer at New York University, doubled down. The answer to her question is, of couse, that 9//11 became sacred on September 11th, 2001, when terrorists flew two planes into the Twin Towers in New York City, one into the Pentagon in Washington, D.C., and one into a field in Pennsylvania. The attacks, of course, killed thousands of Americans -- the most in an attack on American soil since December 7th, 1941, when the United States was attacked by the Japanese at Pearl Harbor. Thankfully, a number of Twitter users filled her in on the details. "I'm pretty sure it was September 11, 2001," said one. I'm pretty sure it was September 11, 2001. "At about 10:00 EST on 9/11/01, as a memorial to thousands of Americans who died in a terror attack, and to Americans. If you have to ask this, ask yourself why, and what steps you should take to change the fact that you're an American who had to ask," added another. At about 10:00 EST on 9/11/01, as a memorial to thousands of Americans who died in a terror attack, and to Americans. If you have to ask this, ask yourself why, and what steps you should take to change the fact that you're an American who had to ask. "Immediately after it happened, to every thinking and feeling person. If you’re interested, here’s the Cliffs Notes version: jihadist terrorists killed thousands of innocent Americans in an unspeakable act of war. Still confused?" said another. Immediately after it happened, to every thinking and feeling person. If you’re interested, here’s the Cliffs Notes version: jihadist terrorists killed thousands of innocent Americans in an unspeakable act of war. Still confused? There have been plenty of odd statements made in defense of Omar's words, not least that any criticism of Omar is de facto "incitement to violence" and that critics of Omar have blood on their hands were something to happen to her. 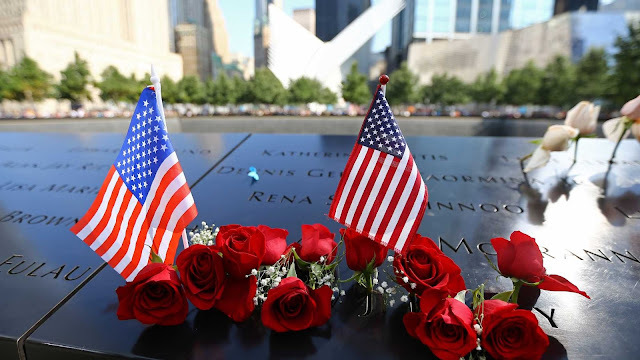 But few Democrats and left-leaning activists have gone so far as to question whether the September 11th, 2001 attacks are themselves worthy of commemoration. But Lavin isn't new to controversy, as noted above, last year she started a meme on Twitter, accusing ICE of hiring an actual member of the Nazi party, after seeing a photo of a double amputee manning one of ICE's intelligence stations. The man, a former Marine, had a cross tattooed on his elbow, which Lavin called an "Iron Cross" -- a historical symbol of both the Nazi party itself and white supremacy. After the photo and the accusation went viral, ICE stepped into correct the record, noting that the man in question was not, in fact, a Nazi, and that the tattoo on his arm was the symbol of his platoon in Afghanistan, not an "Iron Cross." Lavin and the New Yorker parted ways shortly after the Tweet, but she was picked up less than a month later by Media Matters, who hired her as a researcher on "far-right extremism" -- despite her only claim of expertise on that account was the mistaken identification of a tattoo. Lavin, journalism expert as she is, will be teaching a class at NYU this summer on -- what else? -- identifying and researching elements of the "far right."